Tibco Statistica is a flexible analytics system that allows users to build analytic workflows that are packaged and published for various businesses. The technology also helps organizations explore interactively, visualize problems, and craft and rollout statistical, predictive, data mining, machine learning, forecasting, optimization, and text analytics. 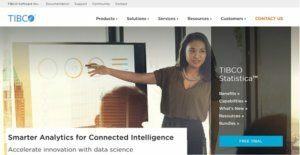 Offered under the Tibco Insight Platform, Statistica makes it more convenient for data scientists to utilize the power of machine learning throughout different programs and massive amounts of data, including those from IoT systems. The software can empower a wider set of business users with its advanced analytics that help turn insights into effective business strategies, with favorable outcomes. Robust Statistica modeling and validation tools for machine and deep learning generate better answers more intelligent decisions, and properly timed actions. Tibco Statistica has intelligent, flexible, and extensive analytics that provides users with the latest deep learning, predictive, prescriptive, AI, and analytical techniques to build innovative models. Businesses can discover new revenue opportunities and streams, as well as ways to monetize assets for a substantial competitive advantage. The software has reusable templates that can be conveniently deployed, monitored, and controlled in production to aid businesses and data scientists in collaborating and understanding issues and studying analytical approaches. With Tibco Statistica, organizations can be sure that projects and deployed under best practices, with a premium on privacy and security. Tibco Statistica can rollout deep insights for businesses to gain competitive advantages. Users can share impactful and convincing data-driven stories that the business can understand, rely on, and utilize. Teams can also be more productive as the common platform ingest, clean, prepare, model, visualize, operationalize, and track analytics, with useful insights provided to the correct people at the right time. Organizations can coordinate, manage, and govern analytics more effectively with Tibco Statistica. This is due to how it oversees the entire analytic lifecycle in a central system, thus boosting best practices and guaranteed compliance to corporate, ethical, and regulatory guidelines. Tibco Statistica is flexible as users can quickly update and deploy data preparations and analytic workflows whenever business strategy and conditions change. This helps create models that are more reliable, complete with version control, audit logs, and approval processes. If you are considering Tibco Statistica it might also be a good idea to investigate other subcategories of Best Predictive Analysis Software listed in our base of SaaS software reviews. There are trendy and widely used systems in each software category. But are they essentially the best fit for your company’s specific needs? A trendy software application may have thousands of users, but does it offer what you require? For this reason, do not blindly spend on popular systems. Read at least a few Tibco Statistica reviews and think about the factors that you want in the software such as the price, main tools, available integrations etc. Then, choose a few apps that fit your requirements. Check out the free trials of these platforms, read online reviews, get information from the maker, and do your research systematically. This exhaustive homework is certain to help you find the finest software platform for your company’s specific requirements. How Much Does Tibco Statistica Cost? We realize that when you make a decision to buy Predictive Analysis Software it’s important not only to see how experts evaluate it in their reviews, but also to find out if the real people and companies that buy it are actually satisfied with the product. That’s why we’ve created our behavior-based Customer Satisfaction Algorithm™ that gathers customer reviews, comments and Tibco Statistica reviews across a wide range of social media sites. The data is then presented in an easy to digest form showing how many people had positive and negative experience with Tibco Statistica. With that information at hand you should be equipped to make an informed buying decision that you won’t regret. What are Tibco Statistica pricing details? What integrations are available for Tibco Statistica? If you need more information about Tibco Statistica or you simply have a question let us know what you need and we’ll forward your request directly to the vendor.